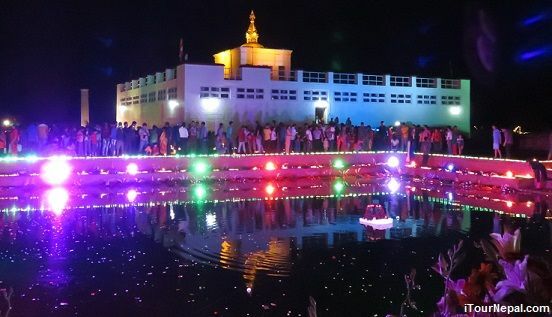 Buddha Purnima or Buddha Jayanti festival is celebrated on full moon day of Nepali month Vaisakha (April / May). The day has triple significance as Buddha was born, attained enlightenment and Nirvana on the day. It is the most important festival for Nepalese Buddhists but is celebrated with great zeal by all citizens. It falls on May 14th in Nepalese calendar. Monasteries will have special pujas (ceremonies), stupas and Buddhist shrines will be white washed and decorated throughout Nepal. Paintings and books on Buddha’s teachings and scenes from Buddha’s life is exhibited. 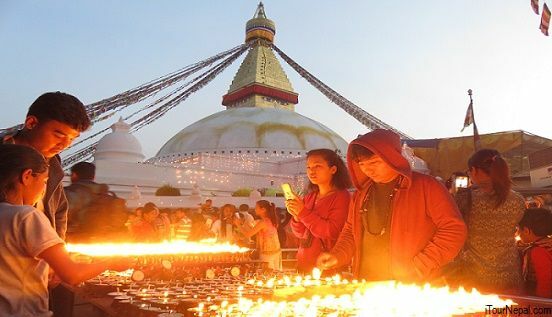 Thousands of pilgrims throng in important Buddhist center like Lumbini, Boudhanath and Swyambhunath. Gifts, food and cash is distributed to aged, handicapped and sick in charity homes and Buddhists centers in a bid to bring happiness to the unfortunate ones. It is beautiful in the evening when these monuments illuminate with hundreds of butter lamps. It is believed that may centuries ago, Indra's (King of Heaven) mother needed specially scented flowers (Parijat). Indra looked for them but couldn't find in heaven. Indra discovered parijat flowers in the Kathmandu valley and tried to steal them for his mother. He was caught and imprisoned by people in the valley. Indra's mother came seaching for him and the people were shocked to know what they had done. They released Indra and dedicated one of the most colorful festivals of Nepal to him to calm down his anger. This festival lasts for eight days with singing, mask dancing and jubilation. The chariot of Kumari, the Living Goddess along with chariots of Bhairab, and Shiva are shown to the public. Various masked dances like Pulu Kishi (elephant dance), Lakhe, Sawa Bhaku and Mahankali dances are performed at various places. Indra is thanked for the rains and assured once again that he is respected in the Kathmandu Valley. 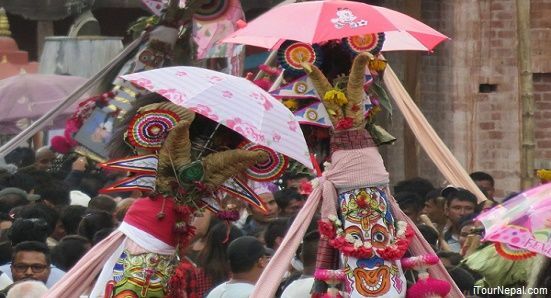 The festival is centered on creation and the mating between the God Bhairav and Goddess Bhadrakali which produced the world and everything in it. The God Bhairav is the fierce form of Lord Shiva and Bhadrakali is the wrathful form of the Mother Goddess. On the first day of the street festival a large 25 ft Yoshin-Pole is placed into a hole and raised vertically in the air. Then the Gods are removed from their temples and placed in large wooden chariots. The chariots are pulled through the crowded streets by the people of Bhaktapur. On the last day of the festival the Bhairav Chariot is parked in Gahi Tole. At midnight the smaller Bhadrakali Chariot is repeatedly rammed against the Bhairav Chariot in a not very subtle display of their explosive copulation. It is destructive and a little bit dangerous for those standing close. A giant game of tug-of-war is performed between the east and west side of the city. It is said the side of town which wins the tug-of-war will be the most prosperous for the following year. 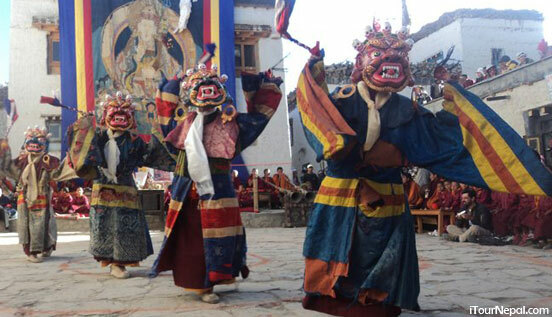 The Teechi (Teeji) festival is an annual event indigenious to Lo - Mangtang (Upper Mustang). The name is an abbreviation of the word "Tempa Chirim" which means the victory of Lord Buddha's incarnation "Dorjee Sonnu" over a demon called Man Tam Ru a vicious creature feeding on human beings and causing storms and droughts. The Teeji festival usually takes place during the last week on May and lasts for 3 days. Dances performed by the monks of Lo Manthang's "Choedhe" monastery during the celebration display. a) The harassment of Ma Tam Ru Ta. b) The birth of Dorjee Sonnu as the demon's son. c) The attempt to return the demon to lord Buddha's realm. Join a trek or jeep tour of Mustang to praticipate in Teeji festival. Teej is a Hundu married woman's day for her man. Married and unmarried women crowd Pashupatinath and other temples of lord Shiva. Women dressed in beautiful red saris with shining glass beads (Pote), singing and dancing is a common sight during this festival as women recall Parbati's devotion to her husband Shiva. It is believed that married women fast on this day for longivity of their husbands and will see the bond of love grow. Unmarried women fast on this day to have good looking husbands. Married women visit their father's homes. All daughters and sisters receive gifts from their male kin, and an elaborate feast is prepared for them. It's a loud and cheerful celebration until late at night, when strict fasting begins. The blessings of Shiva and Parbati ensure tht family life will be joyous for all. On Shivaratri festival, devotees observe fast and keep vigil all night. Shivaratri marks the night when Lord Shiva performed the 'Tandava' - the cosmic dance. It is also believed that on this day Lord Shiva was married to Parvati Ma. The festival take place at all Shiva temples, but particularly at Pashupatinath, hundreds of Sadhus flock from all over Nepal and India. In Yoga and meditations, the day is auspicious for the planetary positions causing easy rise of his / her energy. Another excitement that attracted youngsters and teenagers was on this particular day it is allowed to smoke hashish or Marijuana for gurus and yogis, which is considered as one of the prized possession of lord Shiva. With this trend, Pashupatinath area attracts thousands of teenagers where these illicit drugs are sold and bought openly on this day. Ropain festival or Asar 15 signifies an important day in Nepalese life where 80 % people still peruse agriculture. Ropain means plantation and it is related with rice plantation. Rice is staple food of Nepal. The seedlings that is sowed with pre-monsoon rainfall, is transplanted in the paddies on the day. Working continuously in sun, rain and mud is strenuous especially when farmers have to catch up with the right rainfall. The time for farmer is to ‘reap quintal by sowing kilo’. The ‘Ropain festival’ makes them forget their stress and share some jolly moment. 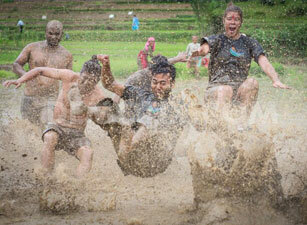 The festival creates a fun filled aura with singing, dancing and splashing mud on each other. Special sweetened yogurt with rice is offered as delicacy of the day. Celebrated in the joy of victory of good over evil, Holi has become the festival of color and love. The festival starts with Holika (demoness) bonfire on the eve berofe Holi. Next day, families, neighbors and friends celebrates by smering colors on each other and throwing water ballons. They share the delicious feast after active and exciting morning. Youngsters and children play whole day. Holi occurs on the full moon day during the end of winter and beginning of spring. Hence the festival is gay moment for all sort of new beginnings. Hence the festival is socially important to breach enmity and prosper in friendship and new relationship. The full moon day festival is about reciting Bedic mantras and changing sacred thread of Hindus. Pilgrims crowd in shrines to receive welfare thread around their wrist. Pilgrims from far flung places visit Gosainkunda (sacred lake). They prey to lord Shiva by bathing in the sacred lake. Kumbheswar Mahadev temple at patan is also crowded with pilgrims where a pond is specially prepared for festival. Dashain is the longest and most favorite festival of Nepal. Dashain falls in the bright lunar fortnight of October and ends on the full moon day. First nine days are celebrated with Tantric rituals worshiping nine different aspects of ‘Durga’ (mother goddess). As the skies clear up after monsoon rain, children fly kites. Big swings are set on the grounds for children and grown ups alike. Animals like buffaloes, goats, ducks and chickens are sacrificed to the goddess Durga on Kal Ratri (the dark night) to celebrate her victory over evil. Following day, on Nawami, people clean their vehicles and sacrifice animals or eggs for safe journey throughout the year. The next day, on Dashami (Tika), people dress up well and visit elders to receive large red tikas of vermilion paste on their foreheads. In the following days of Dashain, families are friends unite, feasts are consumed, blessings are imparted and gifts are exchanged. Sept 12 - 14, Nepalese women in red celebrate with ritualisitic worshiping and street dance and singing. The gai or cow is holy to Hindus as she represents Laxmi, the goddess of wealth. It is believed that she guides the souls of the deprated to the gates of the heaven. The festival is also an occasion for satire, jokes and colorful processions. People who hace lost their family members take comfort in the fact that the holy cow has safely transported the departed souls on their afterlife journey. Children dressed up as cows, and Sadhu as well as other whimsical characters of all sorts fill the streets. Special issues of local magazines are circulated full of satire and jokes of reputed and famous people.